The Financial Conduct Authority (FCA) is today urging the public to be vigilant to the threat of online investment fraud. Fraudsters offering investments in binary options, contracts for difference (CFDs), forex and cryptocurrencies* (such as Bitcoin) often promote themselves online and via social media channels, such as Facebook, Instagram and Twitter. They typically promise high returns and use images of luxury items, like expensive watches and cars, to entice people to invest in their scams. After someone has invested, they distort prices on their website, tie people in with extreme pay-out clauses and even close customer accounts, refusing to pay back their money. This call comes as the regulator reveals that last year investors lost £87,410** per day to binary options scams. This rise in people being targeted online means that the profile of investment scam victims is changing. While historically over 55s have been most at risk to investment fraud, the FCA’s latest study conducted as part of its ScamSmart campaign, found those aged under 25 were six times (13%) more likely to trust an investment offer they received via social media, compared with over 55s (2%). Action Fraud figures reinforce this trend, showing that under 50s are significantly more likely to fall victim to a binary options scam versus other types of investment fraud (34% v 21%). More than one in five (23%) respondents said that online customer testimonies and reviews increase their trust in an investment company. Yet, scammers are known to create highly professional looking online investment platforms that feature fake customer reviews, logos, and statements, to lure in prospective investors. A further one in ten (11%) said they wouldn’t conduct any of the listed checks at all, such as checking whether the firm was regulated by the FCA or registered with Companies House, before parting with their money. 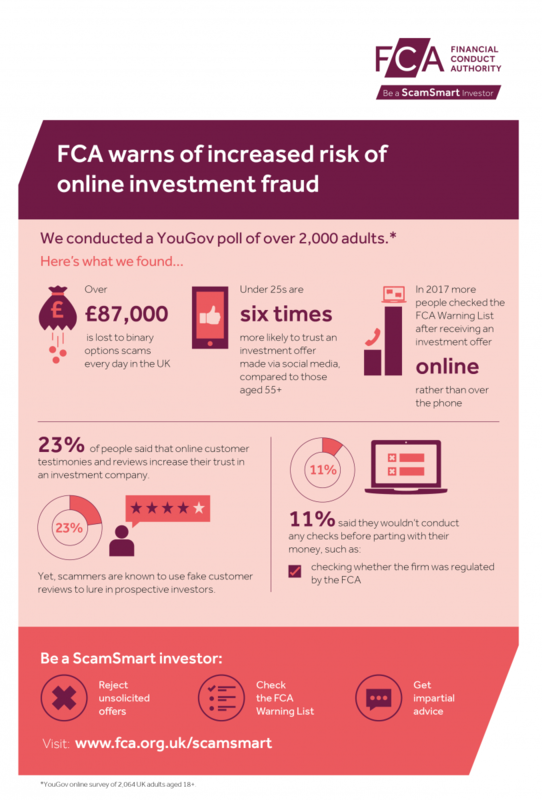 The FCA’s ScamSmart campaign encourages those considering investing to check its dedicated website (www.fca.org.uk/scamsmart). The site features an online tool, the Warning List, which allows users to find out more about the risks associated with an investment and view a list of firms the FCA knows are operating without its authorisation. For the first time, the FCA has seen more users checking the Warning List after being approached with an investment offer online rather than over the phone***. Binary options investments allow consumers to make bets on the expected value or price of a stock, commodity, currency or index. On 3 January 2018, binary options became a regulated investment product, meaning that all firms trading in binary options will need to be authorised by the FCA. Since then, the FCA has published a list of 94 firms without FCA authorisation that it understands to be offering binary options trading to UK consumers. 'As people have become more sceptical of investment-related cold calls and consumer habits have changed, we have seen investment fraud moving online and to social media. 'While their websites and profiles appear to be professional, they are all too often run by fraudsters who fix prices and pay-outs, or in some instances don’t really place trades at all, before disappearing with innocent investors’ money. 'The amount being lost every day to online investment fraud, such as binary options scams, is staggering. It’s vital for all those on social media to be extra cautious about engaging in any conversations or with adverts that relate to quick-wins or guaranteed returns, especially with individuals or companies you do not know. Suspected investment scams can be reported to the FCA at www.fca.org.uk/scamsmart or via their contact centre on 0800 111 6768. *Cryptocurrency is not generally regulated by the FCA, so consumers do not have the protections offered by the UK’s financial regulatory framework. Derivative instruments, such as futures and contracts for difference, which reference cryptocurrencies may however be regulated investments. ***From August-December 2017, the FCA received 6,891 enquiries on the Warning List tool regarding investment offers made online, compared to 3,654 over the phone. All figures, unless otherwise stated, are from YouGov Plc. Total sample size was 2064 adults. Fieldwork was undertaken between 23rd – 27th November 2017. The survey was carried out online. The figures have been weighted and are representative of all UK adults (aged 18+). The FCA also works closely with The European Securities and Markets Authority, which is currently consulting on whether to ban the sale of binary options to retail investors.